Most comments ever: The irresistible rise of Constellation Research? One of several striking common factors, when we see the rise of newer analyst firms, is the way they are bringing together analysts to explore new value propositions. Great insights and good analysts are not enough to build momentum. A great example of that seems to be Constellation, a firm that’s passionate about disruptive technology with a futurologist and macro-level bent that reflects its leadership team and what seem to be independent analysts who pay a membership fee to be represented by the firm (Or is it? The comments below this article, the most for any host on this site hint that there’s another side to Constellation, and uncover a major shift in the firm’s business model that supersedes the account on its website). Social media have transformed the way in which analyst firms reach out to end-users. With HfS, perhaps most obviously, its freemium model has allowed it to win a huge audience. Perhaps Constellation and Redmonk have an edge at understanding the ability to use social media as a collaborative community-building tool. Constellation certainly stands out, with Forrester, in having community at the centre of its self-image. As an example few firms (Constellation, 451 and Canalys come to mind) have the sort of apps that allow attendees to connect at events: perhaps the “late majority” clients of some other firms want to follow analysts rather than learn from each other? That is amplified by the way that many firms are so far behind in their use of social media that, even if an innovative firm was to wait a few more years, it could still have a first-mover advantage. One factor is that Constellation aims to serve a different niche in the global end-user market, which is currently underserved. That reflected in hiring people like Dennis Kanemitsu, a skilled operations leader from Forrester with great insight into the APAC market, but also in looking for new services to connect better with their target 20% of the end-user market: the segments of transformational market leaders and proactive fast followers. The firm’s client base is already impressive, and that’s reflected by the attendees, 70% of whom are end users, and sponsors at the firm’s annual executive innovation summit, Connected Enterprise. We expect that Constellation will bring its style of events to a global multi-city audience. Community and peer services are clearly key opportunities for many analyst firms. Constellation’s has quietly launched its Constellation Executive Network, allowing individuals and their organisations to access research, inquiry privileges, peer networks, and events in one offering. Another major trend is the need to professionalise the leadership and account management at firms, which was partially reflected by Bridgette Chambers‘ rather brief period as Constellation’s CEO. The firm’s new customer on-boarding processes are said to reflect a customer success design point. What does this mean for Constellation’s traction in the market? We’ll find out when the Analyst Value Survey results come out next month. P.S. Of course none of this means that Constellation’s rise is assured or painless; that is why there’s a question-mark at the end of the headline and why this article referenced both the short tenure of the firm’s CEO and the reality that the firm’s analysts are generally independent rather than employees (Constellation points out that most of its team are employees). Despite these issues, and the reality that Constellation does not seem to work for most analysts who join it (the majority move on quickly) its impact on clients is real. The chart above shows that just over 7% of the analyst firm users that responded to the survey said that Constellation is one of the firms they have used: that puts it in the top 20 firms worldwide, on a par with TBR and Digital Clarity Group. Many of Constellation’s competitors are uncomfortable with Constellation and its sharply- tongued founder, and the analysts who have made bad investments in the firm are understandably regretful. That does nothing to lessen the reality of the firm’s survival. P.P.S. Should the last word go to the CEOs of Constellation and Digital Clarity? Take a look at their exchange on twitter. PPPS A followup comment is here on Constellation’s use of psychometrics. Did you look at analyst tenure? I expect greater rigor, perhaps you could speak to the many ex-analysts. Most analysts leave Constellation quickly: that has not prevented it from solidifying its user base. As a former analyst it would be very tempting for me to think that retaining analysts was the key to success for an analyst firm, but virtual firms like GigaOM and Demand Metric with flexible staffing seem to find that strong sales and customer satisfaction are also key. I am a big fan of your work Duncan, but I miss a lot of information in this post. Like the industry’s concerns. Analysts paid only on vendor commissions etc, is it ethical / sustainable? I will tell you my reservations offline. Duncan – so you are implying that it doesn’t matter if an analyst firm can’t retain its analysts? If the analysts become irrelevant, what is the role of AR here? Constellation is Ray Wang and his twitter account. Duncan, I love your work, but you missed the mark here. Both Bram and Anon/Industry Onlooker (AIO for short) raise interesting points. Certainly there’s a lot missing in any blog post: brevity is in the nature of blogs. Is it ethical that analysts are paid only on commissions? No-one seems to have a problem about other firms using freelancer analysts. The nature of freelance analysts is clear: they are paid only when they work. The different thing about Constellation analysts is that they are paying Constellation to represent them, not that they only earn when they work. It’s sustainable only for analysts who don’t expect it to be their major income. AIO is perhaps not an ‘onlooker’ but (if the shared IP address in a distinctive location is a clue) also someone who describes themselves as an analyst. In the opening of this post I write that “Great insights and good analysts are not enough to build momentum.” And that’s more the case for Constellation, which is a sales channel for analysts rather than an employer of analysts (although I was late in understanding that it has switched business models from one where it did not employ analysts, to one where most analysts are employed). Constellation doesn’t pretend to have analysts on retainer, so retention is hardly as important. Ray and the core staff are the engine of the firm. I can’t really say that they are any better as analysts, or more ethical as salespeople, or more reliable as representatives, than any others. But the fact is that they exist as a force in the market and represent, as do HfS and other, the niche power of analyst firms that are born in the cloud. We’re thankful that Kea is shining the light on an issue that many in the industry know: Constellation may not be as advertised, and requires further analysis. I wanted weigh in here with what I can publicly comment and let you read between the lines. We have nothing to hide and if we have alumni who’ve left that have grievances, I encourage them to comment directly and publicy instead of hide behind anonymous identities. These are not easy skills to master on their own, let alone a combination of the above. On top of that, we aren’t pestering vendors with requests to write a white paper. That old pay to play model just doesn’t suit us. So this makes it hard to make it all work. We know it’s tough, but we also know it’s worth pursuing. We do have to thank over 100 sell side (vendor) and 200+ buy side (end users) clients. And to address someone else’s comment, these aren’t webinar attendees (we’d be able to list 1000 clients in that case) These 200 represent folks who’ve engaged us for subscriptions, advisory services, or attended our programs. 1. Awesome opportunities that you can’t refuse. Here are some public ones (not breaking any NDA’s Here) For example, Amy Wilson was asked to join Workday pre-IPO to lead the product management of a key product. Yvette Cameron had a great opportunity to join Gartner after learning the ropes with us. Peter Kim has an awesome once in the life time ex-pat opportunity to move his family to Korea and lead as the Chief Digital Officer at Cheil Worldwide. Bridgette took the opportunity to launch a global innovation community for women which was much broader than we could do at CR. We’re excited for their success and accomplishments. 2. Family illnesses, and personal circumstances. We’ve had a number of analysts and team members that had to deal with a passing family member, long-term illness in the family, or personal illness. I won’t list their names to respect their privacy. However, life happens and this job requires a certain time commitment for success. We’re glad we were able to learn from each other during their tenure with us. They are welcomed back at any time and they know that. 3. Bad model fit. We realize this is a tough model to break out into this industry. For those new to the industry, this model may take longer to break out in the market. For independents like our friend below the “out to pasture old white guy”, the model of writing white papers for hire or serving as a product marketing consultant does not align with the Constellation business model or approach. The sales team often can’t pitch a bad product or bad analyst in those cases. We don’t do pressure sales or try to make our sales teams “sell a pen” when there is no value on the other end. Thus, no market, no sales, no analyst traction. The natural reaction is for analysts to blame sales. The natural reaction for sales is to blame the analysts for not having product. As you can see, a fun chicken versus egg argument that wastes time. 4. HR issues. I hate to say this but we had a number of cases where the analysts that represented us crossed the line with female AR, PR staff whether on twitter, at events, and in other public settings. While we will not name those bad actors, we do want to share these circumstances in public. 5. Deadbeats. In our old model where analysts paid a membership fee to cover overhead for sales, marketing, and other lead gen activities, a few analysts thought it’d be okay to stiff the firm. Those folks know who they are and well, we won’t forget them. Building a new firm isn’t easy. As another person alluded, we are using a personality test. To be clear, this is an aptitude assessment. We work with Dr. Janice Presser and her team at The Gabriel Institute to identify the right attributes to balance a start-up environment and the roles we hire for. This includes analysts, sales, marketing, operations, and management. Since we implemented the assessment, overall attrition has significantly dropped. Thanks all for your time and patience. We’re happy to address and answer any questions in the open. It’d be nice to know who all the anonymous folks are but that’s the nature of the business. We’ve learnt that the constellation team has deployed a specialized personality test to match aptitude with company fit. It seems that it has helped them with attrition. Some of their analysts when they started were clearly old grouchy grumpy white paper vendor only types. i was a bit surprised at first thinking they would reform. clearly ray thought otherwise. he reverted to getting rid of them or they left because they could not make a living in a model that did not tolerate pay to play. Let’s look at these stats more closely with the hat of a Analyst Relations professional on. 22/26, which is 86%, of Constellation Analysts have left, most very quickly. Many don’t even list this new firm on their online profiles. Duncan, there’s a large enough sample for you to conduct research to find out “why”. Duncan, experience has taught me that Analyst Relations and buyers expect to have a long term relationship with their advisors, which are often seen in annual contracts with firms. This is at odds with the above data. Also, we encourage Kea to do deeper research. in particular, Constellation lists “clients” as webinar attendees, is that worthy of a respected Kea list? Duncan, Bram, will you do deeper analysis on this “firm” on behalf of the industry? I think the suggestion of deeper research is a great idea, but I’m not sure what research would give insight. For example, we could interview people who used to work for Constellation. They would say, I imagine, financially and professionally it was a mistake. 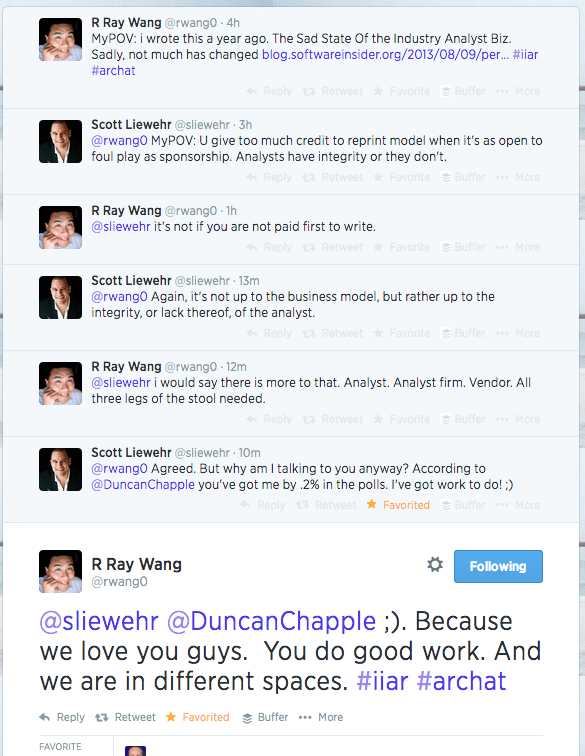 “Ray seems lovely until you work for him, and then you find out he’s not a great boss of analysts.” Everyone prefers to have long relationships but, honestly, if you expect to have a long relationship with an analyst through GigaOM or Constellation aren’t you a bit foolish? The big fact remains: Constellation’s analysts membership model exists, and it’s been able to maintain its position on the edge of the top 20 firms with end-users. It’s not a personality test but it helps find the right fit for the culture we seek to build. The analysts who left CRG did so mostly b/c it was bad for their personal businesses. Many left and still deal with unfounded harassment and criticism from Ray continuously at industry events, on twitter and in conversations to vendors. To suggest that somehow an aptitude test resolved the personal and corporate tension and strife from the Ray towards, well just about everybody who was there in that period is ludicrous. The amount of turnover at CRG over 3 years is astounding, I don’t remember ever seeing that in any analyst firm regardless of structure in decades in the field. sounds like you are an insider. i’m sorry you didn’t work out for the firm. we have 5 reasons why folks left. I won’t call you out on which 5 you were in, but it’d be nice to know who you are, so people reading could make up their own minds. Is it reasonable to compare Constellation’s turnover with mainstream analyst firms, breaking in mind that it’s a business in which already-successful people roll in their business in the hope that the membership fees and time contributed will help them leap forward? Most people who have joined GigaOM have left it; those firms can be successful and still not be long-term homes for most members. Isn’t GigaOM Pro a better comparison? Duncan, please explain how AR should approach this new way of working with these firm(s). I think that is of relevance for the readers of this blog. The same way as before; build relationships with individual analysts not account managers. “if you expect to have a long relationship with an analyst through GigaOM or Constellation aren’t you a bit foolish?” So explain, because this means I cannot build one. Is it based on a previous relation? You need to build a relationship with the analyst while holding on to the understanding that they have an independent career and could leave. Just to be clear, the original model from 2010, we created a shared services model so that every analyst would put in 20k a year to cover marketing and sales. They’d get the money back if they met deliverables. As you can imagine, only a few folks made it in that model. About 2.5 years ago, I sat down and said, what can we do to change the model. We then went to a different model of rev share that was more in alignment with a true IC model. That didn’t work as well as we needed a different type of analyst. Few analysts met writing goals and writing standards. As we entered our 4th year, this January, we thought hard about what biz models we should adjust. More importantly, I wanted to share stock with the team. I had to sit down and think hard as to who would I really want to have ownership. We realized the employment model would be the best for now and it allowed us to provide benefits to the team that we couldn’t in an IC model. So, we’ve moved to an employed model, full benefits, stock options, etc. Those who wanted to remain in any of the previous models could as well. The result has been positive. But feel free to ask the team. I doubt that disposable /high churn analysts are a sought-after segment of Constellation’s growth plan. Churn for its own sake just does not make sense – except possibly as a value-neutral side effect of other aspects of their business model. Constellation needs to replace the personal analyst relations its churn makes difficult with other personal relations – guru-led peer to peer is a viable model if they can sort it. I am a analyst relations professional who has dealt with some of the analysts that Constellation let go. Ray’s strict view on no pay to play was seen as restrictive to the independents who were used to writing gratuitous vendor white papers. Behind his back, they often complained that they couldn’t make any money writing papers without being paid first. Many of these analysts approached us to write papers on the side whilst with Constellation. They did not value the brand nor respect what Ray created. I can see why the independent analysts could not make a living in the Constellation model because they has no influence in deal flow. We saw them as pay to play despite being given the cover of Ray’s brand. We tried to give them benefit of the doubt. Now on their own, they are back to their pay to play ways. We have to avoid them though they keep pestering us for white papers and often threaten us and other AR professionals with bad coverage if we don’t pay up. I’m glad Constellation and Ray let many of those folks go. Constellation is better off without folks who create vendor influenced content and pollute the analyst model. It’s amazing to see many of them vindictively commenting on this board. Amazeballs! In this business your credible by your name, not your anonymity. I almost never comment on blog posts nor do I comment on comments, but to be honest, some of what I read here goes beyond reasonable commentary and just tends to be clearly bitter people crossing boundaries. To be clear, I sit on Ray’s Board of Advisers. I am not an analyst who works for him. I have my own independent practice and have been pretty successful standing alone. But I have some definite thoughts on the analyst business and what I’m reading here. First, it takes time to build a business that works. In the course of building the business, there is trial and error, there are relationships that go awry, there is a lot of change that happens that creates damage etc. Its the nature of the beast. From the employer side, their job is the find the right model and fit, to minimize damage along the way and provide as much opportunity as possible to the employee while still receiving value for the business. Its not an evenhanded process – ever. From the employee or staff side, they get to choose to participate since, one has to presume, they are adults capable of making that choice. As some here point out, sometimes the fit between the employer and the employee (I use the term non-technically given the nature of Constellations’s model as it evolved) is right and sometimes it isn’t. Sometimes you love your job and sometimes you don’t. Sometimes you think its going to work and it doesn’t – and sometimes you think its going to work and it does. All in all, its part of the the risk that adults take when they choose to accept a job offer and that an employer takes when they make the offer. Ray makes it clear I think that it took a few permutations of the model to finally settle on salaried employees with full benefits as the best model for Constellation (plus, like any other self-funded young business, it had to grow to the point that they were able to do that – which they have). The issue here seems to be that it didn’t work for some people. So be it. But whoever you are, move on. I don’t think that this embittered approach serves either you as a human being or the industry or other analysts. You are coming across as a small handful of rather nasty people who are deliberately trying to hurt something that didn’t work for them. For example, who goes to the length of naming everybody they can think of who left a company – and names them without their permission? First Why do that? Second, why do you think you shouldn’t identify yourself since you think its okay to identify other people without their permission? Third, this helps you, how? Ray has built a highly respected brand with Constellation. Most of the work coming from it is quite good. It is influential..Constellation is fascinating to me because the brand has become influential is a much shorter time than most companies could dare dream. That comes because people trust the insights of the persons involved who are writing for the company. Customers are not stupid and easily deceived, despite what naysayers like to believe generally. They don’t continue to buy shoddy products that don’t benefit them. They buy what they feel helps them do whatever it is they do. Constellation has managed to do that despite the burps and hiccups along the way. Look, I’m sorry it didn’t work for you. But move on already and enjoy the rest of your lives doing whatever it is you want to do somewhere else. Constellation is an honorable brand or I wouldn’t be associated with it. I don’t often agree to be on Boards of Advisers because I don’t have the time. But I felt that this was worth the time, even though the model isn’t one that works for how I do business. But the quality of the work and the value it provides is good for the business world. Those of you here who don’t like the model, then you don’t. Be as public as you want to be about that. Argue a better model. Build your own company. Work for someone who you find a more suitable fit for yourself. But cut out the personal attacks. They aren’t worthy of an adult who made a choice that just didn’t work out. Each time you lash out, makes you look like less than I am sure you are. I’m sure I even know some of you. I’m sorry you feel this way, but making it personal never helps anyone – ever. Constellation Research as Duncan points out has become a respected and competitive brand. It took a while to figure out how to do things that work for both employer and employee. Ray makes it clear in his discussion that the model that probably works for Constellation is going to be salary and benefits. That eliminates 90% of the problems that seem to be driving the bitterness. So, whoever you are, wish Constellation luck, I wish you luck, and lets all move on. The comments here raise even more questions about Constellation and I agree Kea should look at this firm carefully. If CRG Analysts only get paid if something is sold, it sounds like Consulting, not a Research firm. That said, why trash former associates? They all had great reputations before joining Constellation. It makes you look bad and it is unprofessional. Founders aren’t always the best people to run a firm. I think you have, like me, missed the change in their business model onto an employment model. But I totally agree that founders are not normally the best people to run a firm. The real gripes that people have about Constellation are varied: the firm has build a real of modest beachhead with end users on the back of savvy social media and a sales and operations engine that aims to leverage high profile analysts. That was clearly not a win-win for everyone involved, and the tensions around that have created some challenges for the Constellation brand. That is something largely separate from the industry’s widespread use of freelance analysts, although that is certainly also tricky. Well I learned more about the IT analyst model in this comment section than most of my years in business, dating back to about the time Microsoft was in NM. As a so-called vendor, I’ve had terrible experience with the pay to play model and pushed back hard enough to where it had an impact with leading publishers, customers, and governments. I made the decision at least in the early years not to pay anyone for content or reports (until such time that we have sufficient customer support to influence the market). For many years I was an independent consultant doing real heavy lifting–auditing companies, bankruptcy turn-arounds, and even a few fraud cases. I saw violence as I arrived on scene multiple times, organized crime that wasn’t known by investors, secret families of sole proprietors unknown to heirs and all kinds of other not-terribly-fun situations. But there is no way whatsoever that I would have ever considered representing both a customer and vendor simultaneously as has become the norm apparently in IT. That is the definition of a corrupt process and industry that caused the downfall of Enron among many others. I have seen smoke where I think the relationships between IT vendors and analysts crosses the line. And it’s extremely unethical–should be illegal, to have life-long NDAs surrounding ethical issues on modeling, silencing former analysts or face a legal bully and possible bankruptcy. The relationships with some firms with customers is apparently fairly murky as well. This is not a healthy industry folks–not even. I’ve seen it before several times. Don’t be surprised to see some surprises. To all those attempting to change the industry–I have some take it or leave it advice. Follow a few very basic rules–fully disclose conflicts, provide public metrics on the business (some don’t at all while analysts criticize others for not doing so), do not represent clients that are competitors or vendor/customer in an advisory capacity simultaneously. Otherwise, frankly–I don’t think anyone should hire the firms for any reason until they clean it up. And those who are customers should have their governance committee review–I’ve suggested to several they do so. Good luck with this royal mess folks.